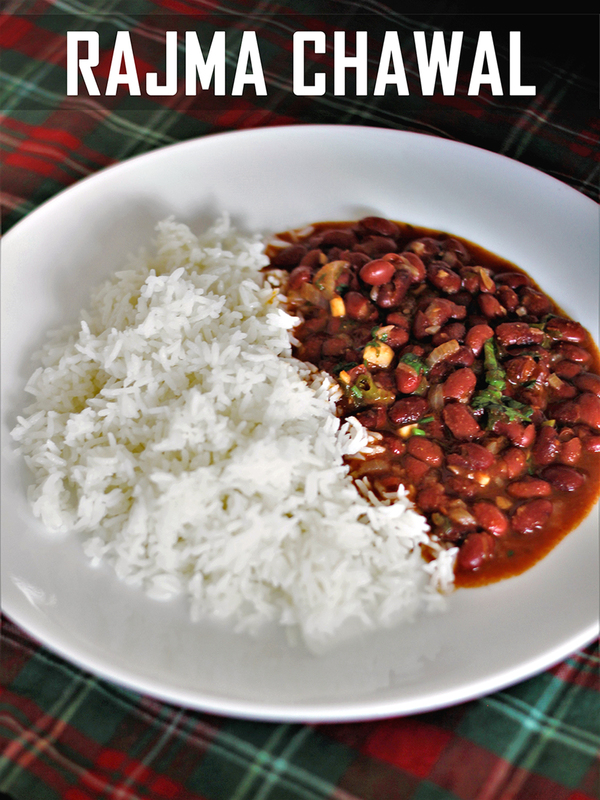 Rajma or Red kidney bean is one of the most popular dishes in North India. It is not only delicious but also high in protein content that makes it a very healthy and wholesome vegetarian meal. Rajma curry is my favourite; I love to have it with either rice or roti. You can make this curry mild, spicy, or extra spicy by increasing the chilli level as per your liking. This curry is super easy to make, all you have to cook the rajma with a few basic ingredients and add a few spices. You will get a delicious curry in few minutes. The most important thing you have to remember to do is cook the rajma well so that it is not undercooked. Normally it takes 5 to 6 whistles in the pressure cooker for rajma to be ready if it has been soaked. You have to soak the rajma for at least 8 hours or preferably overnight before preparing the curry. If you are cooking it in a regular pot, cover the rajma with water and bring it to a boil, simmer for 45 mins to 1 hour or until soft. You can add some salt to the rajma water while boiling so the rajma is not bland once in the curry gravy. Since it takes so long to cook in a normal pot, it is better to invest in a pressure cooker for fast cooking. In a pressure cooker, it takes under 15 mins to cook. Now let’s see what all we need and start cooking. 1. Soak rajma overnight. Drain and add it to a pressure cooker with some salt and cover with water. Pressure cook for 5-6 whistles or until the rajma is well cooked. Turn off the heat and let the steam escape all by itself. 2. Heat oil/ghee in a pan and add the onions. Fry them until they turn light golden brown. 3. Add the ginger and garlic paste and fry for a few more minutes. 4. Add the pureed tomatoes and mix well. 5. Once the oil starts to separate add all the dry spices and mix well. 6. Add in cooked rajma with water and mix well. Adjust the salt. 7. Simmer for 10 to 15 minutes and check if the rajma is well cooked. 8. Garnish with freshly chopped coriander leaves. 9. Serve along with steamed rice or hot roti’s. I would love to chat with you in the comments section, please let me know about your experiences when you make the above recipe, Please do Like, Share & Comment. Till then Take Care and Happy Cooking! You have been sharing such delicious recipes for a long time. I have been following you for this kind of recipes as well. I was working in a college essay writing service and saw a lot of your fans out there. Thanks a lot for sharing another delicious recipe with others at this platform. People will try this at their own. Cooking the beans or rice in a curry sauce does not require a special attention to be successful. This vegan dish will certainly be appreciated for its amazing taste. ©2017 CAMERA CUISINE . Ethereal theme. Powered by Blogger.